Froots magazine’s 30th Anniversary concert offered a diverse range of performers on a bill headed by English activist/musician Billy Bragg and the Acoustic Blokes and the dynamic, award winning (Best Crossover Album 2008) duo of English rock guitar virtuoso Justin Adams and roti (African one stringed violin)playing singer/songwriter Juldeh Camara, among others. But before the show’s many headliners took to the stage, several other artists, some still on the rise appeared, among them Jim Moray, award winning English (fRoots Critics Poll and Mojo Folk Album of the Year 2008 for Low Culture) guitarist, singer and songwriter, Zuzana Novak, an Anglo-Czech mbira (sacred instrument of the Shona people of Zimbabwe) player extraordinaire whose track ‘Nhemamusas’ was featured on fRoots quarterly sampler - January 2007, Massachusetts born guitarist/singer/songwriter, influenced by traditional Irish folk music, Pamela Wyn Shannon, whose second album, Courting Autumn was among the Top 10 Best Albums of the Year 2007 in Heaven magazine (Netherlands) and also on fRoots playlist, and Laurel Swift, founder and choreographer of Morris Offspring who did some fantastic clog dancing and in her ‘other lives’ is a fiddle player with The Gloworms, double bass player with Gadarme and also appears with Sam Lee’s Gillyboys. Having acknowledged that, I have to say that one of the surprises of this show for me, a devotee of the ethics and music of Billy Bragg and the musical output of eclectic twosome Justin Adams and Juldeh Camara, was the discovery of gifted and versatile singer/songwriter, Devon Sproule from Virginia, by way of Ontario, Canada, who performed with her talented guitarist husband, Paul Cuirreri. Sproule’s 2007 album, Keep Your Silver Shined was an indie hit, in the UK, Ireland and Europe. She has also had the honour of being the first American artist to appear on the cover of fRoots in the new millennium and has appeared on Later...with Jools Holland. As singers go, Sproule has the kind of voice that makes you believe that she could sing any type of song, especially as she is capable of catching listeners unaware with unexpected twists via moments of supreme tenderness or low down, mood-shifting hollows. Those qualities were very much in evidence during her rather impromptu rendering of the WWII classic ‘White Cliffs of Dover’ at the conclusion of the show, which was touching despite the fact that she was struggling to figure out how the song went as she was singing it, saying ‘help me out fellas’ to the musicians backing her. If you don’t know who Devon Sproule is, I’m sure you’ll be pleasantly surprised when you hear her. Don’t Hurry for Heaven (2009) is her latest album. By way of backtracking, the Ian King Band manned the opening slot, with a seven-piece brass-infused blend of folk, soul and jazz, with dub and reggae infused rhythms enlivening their eclectic mix. Bespectacled King, front and centre in an Amnesty International t-shirt, lead the set through many changes, ending with a world melting pot sound. King and his band, who are often referred to as the ‘Nick Cave and the Bad Seeds of folk music’ recently released their debut album Panic Grass and Fever Few, on Fledgling Records. Guitar virtuoso Justin Adams and riti (one string African violin) master Juldeh Camara shared top billing for this show with good reason – their music is unique, enjoyable and totally infectious. While some listeners who had, obviously, never heard them before seemed somewhat perplexed by their instantly compelling playing, others were openly digging the duo’s groove-laden mix, and, as their hand in glove playing progressed, Adams advised the crowd to ‘come see us play sometime,’ as he’d done at King’s Place when the pair had played a condensed set at the International Guitar Festival, with Adams advising us that he ‘likes what happens in the middle of the night’ when they’re playing a long gig before an enthusiastically dancing crowd. Their funky opening number, ‘Marianna’ got me and a lot of other listeners going, but these two have been known to play as though they are one groove making machine, and this outing was no exception. ‘Sahara’, the opening track from their latest album, Tell No Lies, was another standout, with Camara soulfully singing the word over and over as if it was a sultry mantra, while Adams’ echoed Camara’s vocals, his guitar simulating the clopping of a camel – soul, revved up a notch, or two, or three. Adams’ crawling, searching guitar and the sounds emanating from Camara’s quavering bow suggested open expanses. At one point, during a blues infused number, Adams leapt across the stage, duck-walking his way back towards Camara Chuck Berry style, as a collage of Afro flavoured licks exploded from Camara’s riti against some blistering rock riffs from Adams’ guitar. Adams and Camara may seem like an unlikely coupling at first, but once you’ve heard them, you’re bound to be converted. The Martin Simpson Band is fronted by their namesake who, is acknowledged as one of the best acoustic and slide guitarists in the world. But Simpson, an Englishman who lived in the States for fifteen years, is also known for his fine song-writing skills and has won many awards, among them, BBC Folk Musician of the Year (2002 & 2005, nominated in 2009) Album of the Year - Bramble Briar (2002) 5 nominations in 2008 – 2 wins for Prodigal Son, and finally, 6 nominations this year for his latest release, True Stories. Simpson’s repertoire reflects his love of old time music, blues, and classics like those penned by Dylan all of which are reflected in his own material. Simpson’s story and subsequent song about an elderly couple he’d known who were struggling to get by in New Orleans, with its ‘morning smells of last night’s fun’, among other numbers brought his narrative performing skills home to his audience. Many in the crowd also responded favourably to the appearance of folk-rock group the Oysterband and their guest singer, June Tabor, one of the ‘great English folk divas.’ Although the band with its fiddles, guitars, accordion and drums has been playing and recording albums since the early ‘80’s, their 2007 release, Meet You There was hailed by many as their ‘best recording ever.’ Tabor sang with them on their 1990 album, Freedom and Rain and in 1992, Elvis Costello wrote the song ‘All this Useless Beauty’ for Tabor, which she recorded on her album, Angel Tiger. On this occasion, the group, who are known for distinctive covers, as well as for their own material, performed the Nico and Velvet Underground classic (with no acknowledgement of its origin) ‘All Tomorrow’s Parties’ with Tabor’s deep, gutsy vocals working wonders amid the group’s mimicking take on John Cale’s unique droning sound stylings. On the original recording, drummer Moe Tucker played her drums with mallets; Oysterband’s drummer did likewise on this number. Another popular cover was a slower tempo version of Ian Curtis’ and Joy Division’s, ‘Love Will Tear Us Apart,’ a sure crowd pleaser on any occasion. A traditional number, ‘Bonnie Susie Clyde’ saw the group opening up, including Tabor. The closing number, ‘Bright Morning Star Risin’ was the perfect showcase for Tabor’s remarkably resonant voice, as it merely featured some light accompaniment from the group’s cello player. 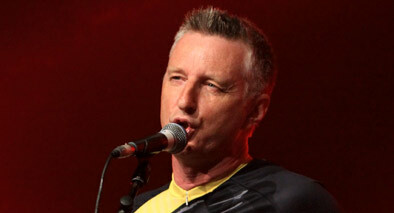 As is always the case whenever he appears, Billy Bragg provided many of the show’s memorable moments by way of social content, via comments to the audience and through the songs he and his band the Acoustic Blokes performed. The refrain ‘They’ll treat us like fools till we rewrite the rules’ in a solo opening song speaking of people sticking together to stand up for their collective rights packed a powerful message in the context of a rousing protest song. Bragg’s comically touching ‘I’m a Milkman of Human Kindness’ (who’ll give you an extra pint) was another welcome number. His spirited rendering of the Woody Guthrie anthem, ‘You Facists Are Bound to Lose’ was linked in with his concerns that on May 6th the BNP may gain inroads into the political mainstream of the boroughs of Barking and Dagenham. Bragg is the genuine article in that he’s always got crucial things to say about pressing social issues, which we’d do well to listen to, and act upon. In my humble opinion, Billy Bragg and his socially aware music doesn’t get older, it just gets more relevant. After singing ‘You Stopped My Smile in Its Tracks’ and commenting that ‘you know you’re getting older when NME calls you a folk singer’, Bragg went on to speak of the ‘oral tradition which was a big part of his childhood, and sang a song that his Gran sang every Christmas, ‘Underneath the Arches.’ ‘There’s your folk music,’ Bragg said to the audience at the end of the song, a satisfied smile on his face. Frankly, I’m with him on that count, as I feel that far too many of England’s finer traditions have been sacrificed in the name of style. The end of Bragg’s set was a rousing audience participation version of ‘A New England’. At the end of the concert, when everyone who’d performed in the show, including one or two artists not mentioned here, whose names weren’t listed on the line-up, returned to sing the song with Bragg, who described it as ‘this year’s official World cup song,’ he presented the show’s organiser, Ian Anderson with a dropping bouquet of flowers which he said would look good ‘when you’re in hospital,’ as he claimed Anderson was running himself ragged to get things together for the show. This one-off concert Roots at the Roundhouse was a very special occasion and one which its organiser, fRoots Editor Ian Anderson hopes will become an annual event. Here’s hoping it does.